USDA Organic Thickener for Hot & Cold Liquids. Each box includes 30 individual serving 2.4g sticks. Each stick (2.4g) thickens 5-6 fl oz to mildly thick (nectar) or 3-4 fl oz to moderately thick (honey). Purathick is the first USDA organic thickener in America. 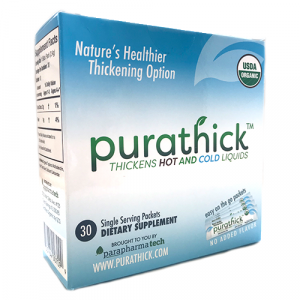 Purathick increases the viscosity (thickness) of cold and hot liquids effectively. Thickened beverages are sometimes recommended for the management of conditions present with dysphagia. Always consult a medical professional before thickening liquids to ensure it is appropriate for your individual needs. Not for use with infants or children under one year old. Do not use if galactosemia or allergy to galactomannans is suspected. There are very few cases of allergies to galactomannans reported in academic literature. If an allergic reaction occurs, discontinue use immediately and seek medical attention. Each individual serving stick (2.4g) thickens 5-6 fl oz to mildly thick (nectar) or 3-4 fl oz to moderately thick (honey). 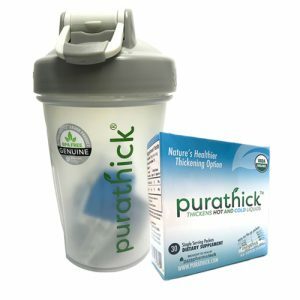 Purathick is made of 3 simple ingredients: Organic Tapioca Maltodextrin, Organic Tara Gum, and Calcium Carbonate. Consisting of an off-white fine powder, Purathick is tasteless, odorless and smooth when dissolved in warm milk. 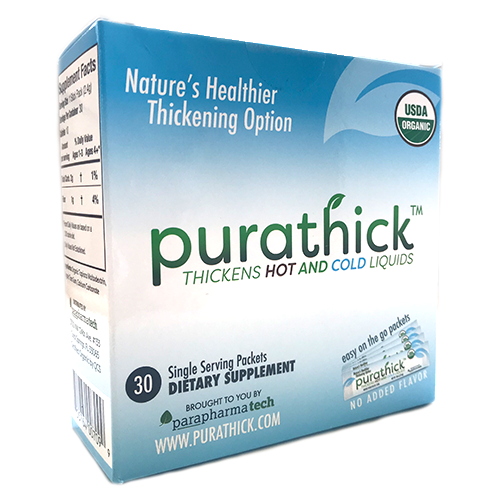 Purathick is hypoallergenic, free of corn, wheat, gluten, soy, whey, casein, lactose & dairy. It is also non-GMO, vegan & made with kosher pareve ingredients. Gelmix Infant Thickener, USDA Organic Thickener for Breast Milk & Formula. Each Gelmix 125g jar includes 52 servings and a 1/2 serving 1.2g scoop. Each serving (2.4g) thickens 5-6 fl oz to slightly thick (thin nectar) or 3-4 fl oz to mildly thick (nectar). USDA Organic Thickener for Hot & Cold Liquids. 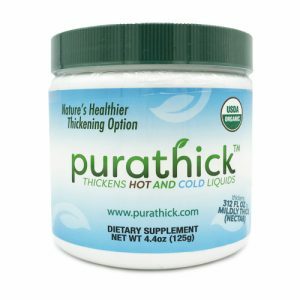 Each Purathick 125g jar includes 52 servings and a single serving 2.4g scoop. Each serving (2.4g) thickens 5-6 fl oz to mildly thick (nectar) or 3-4 fl oz to moderately thick (honey). BlenderBottle Classic Loop Top Shaker Bottle, 20-Ounce, with Purathick logo printed on one side. NOTE: 20-ounce capacity, measurements only go to 12 ounces.